Now that we’ve shared our exciting news, it’s time for us to give you an update on ministry life here in Belize. Back in August David and I were blessed to be able to take our annual vacation for a few weeks. We ended up going to back to Peru because I had loved visiting there last year. As a whole it was a wonderful time to get away and relax. The first half of our trip was perfect (I do enjoy escaping to cold weather! ), and the second half was nice, but a little harder as we dealt with health issues. Many of you have been praying for David’s health (damaged elbow, high blood pressure, etc.) and unfortunately the high altitude on our trip really did a number on his health. Thankfully God protected him from the worst of it and we were able to adjust our travel plans to get him feeling better faster. Please continue to pray for complete healing. Once he started feeling better I came down with the flu and a bad sinus infection. Bummer. But, while it’s kind of sad to end a vacation sick, it does make you really appreciate going home. There’s nothing like your own bed! Once we got back to Belize things quickly went into full swing with the start of the Fall semester. At this point we also knew I was pregnant and got to go to the first doctor’s appointments and see the first ultrasound. Very exciting! So September ended up being very full, as well as going by very quickly. For me, besides being Super Sleepy, this meant restarting choir and piano lessons. Choir last semester ended on a rather low note (no pun intended! ), so I was weary about starting up again. The good thing about Fall though is that you get to prep for Christmas! With Christmas in mind, and the fun we’ve had in the past with choir I decided to give it another shot. This year I’ve been blessed to have a parent volunteer who has agreed to attend the rehearsals with me. Having another person there is wonderful help! One of the other big changes, and helps, this year is that about half the choir is from previous years (so I have a base of kids who know how choir works) and the other half is entirely new kids for this semester (adding a fresh start to this year). We are having lots of fun singing together as we prepare for Christmas. Piano lessons are also continuing to go really well as I get to know the kids and their families better. It still amazes me that God gave me such a love for music and a way to share that love in our work here in San Ignacio. We continue to work very closely with the three Anglican schools here in our area. I think the chapel services are my favorite part about working with the schools. Kids have the best questions! In the rural schools I still work with the younger kids, and David with the older grades. While I’m primarily doing Bible stories for the lessons, David is taking the older kids through the Bible with hand motions. I had never seen this before, but it is an amazing way to keep the kids engaged, and help them really learn the Bible! David also has a lot of extra work with the schools since he is both the chaplain and the local manager. That means he has both pastoral responsibilities (like teacher devotions and counseling) as well as more administrative work (like responding to staffing issues). It’s a lot for one person, but he does it really well and has gotten to know the families much better through his involvement. Please continue to pray for him as he works on time management and dealing with stress. One of our big focuses this year have been on leadership development. We have so many youth that we work with who have hearts for God and a real ability to lead. There have been a few different ways we are working to build up these emerging leaders. To start, we have two young women who would like to be lay ministers in the church. Anytime people want to take on a leadership role in the church it is incredibly encouraging. David teaches classes each week to show the girls everything they could be doing both to assist in the church as well as to train new disciples themselves (this involves everything from going on pastoral visits to helping teach catechism classes). This Fall we have also started our evening service at St. Andrew’s Church. The whole purpose for starting this service was to both create more space in the mornings (as the morning service is getting rather full) as well as to have a youth lead/youth oriented service. We have two young lay ministers who lead the service, another girl who comes and helps lead music on her ukulele, and a few other girls who help lead the singing. While we are starting off on the smaller side, it is easily becoming one of the favorite services. Again, having a group of youth who want to step up and lead in the church is wonderful! We have also seen the growth in leadership with the two boys who help lead the evening service. They have taken on a more active role in the youth group (which has more than doubled in size this semester) by both planning the games and leading worship. I’m also continuing with a high school girls Bible study to both learn more about God through his Word, but to also build the relationships with these girls that hopefully will build them up into disciples who make more disciples. Please pray for our emerging leaders. There is so much going on! It is always hard to write these updates as I’m never sure what to say and what to leave out. Just know God is continuing to do big things here in Belize. Our most recent big event in the church over the past couple weeks has been the annual Harvest festivals. Each school and church has their own celebrations. Harvest is basically like Thanksgiving, but with a stronger focus on God’s blessings and provisions. The schools participate in the service by having the different grades prepare baskets of fruits/vegetables/cakes to process up with to the altar. Once they get to the front they give a presentation of thanks (usually a poem or song) and then present their gifts to God. After the service the pastries are sold and then the produce is given to needy families, with leftovers being sold. Each service, while similar, is very unique and easily our biggest services for the entire year. At St. Andrew’s alone we end up having close to 700 people attend the harvest! Here we are already at the end of October and wondering where the time went, but with so much going on it is no surprise that it is flying by! So now to look more towards the future. One of the big things we want you to pray for is the Hansens. As you may recall from a previous update, there is a family coming down to serve with us here in Belize for an entire year. We are very excited to meet and serve with each of them (Evan, Missy, and Annabelle)! Next week Evan is coming down for a week to go house-hunting and then he will return with his wife and daughter in December to officially start ministry here. Please be praying for their family as they continue to prepare for this huge transition. Please also pray that we are able to find the perfect house for them in the time that Evan will be with us. Moving is always stressful, and moving to another country is worse. So lots of prayers are appreciated for the Hansens. David and I are also looking towards next year for more personal reasons. Our baby is due at the end of April (right after Easter, because that’s not a busy time of year … hehe). We are very excited, and a little nervous. While April seems far away now we know the time is going to fly. So there are a few things we ask you to keep in your prayers. Please continue to pray for a healthy pregnancy, baby, and birth. We are planning on staying here in Belize for the birth of our Little Bean. This is not only a better option financially, but our child will have dual citizenship from birth. As someone who is still working on getting permanent residency (and living on a yearly visa), I’m very excited that our child will not have to deal with all of the immigration paperwork. What this does mean though is that almost immediately after birth we will be working with the US and Belizean consulates to get all the passports and documents in order quickly for our child. Please pray that everything comes together quickly with no complications. As you may already know, next year is our three year mark here in Belize since we moved back together. That means we are due to return to the States for a few months for our “home assignment”. This is where we travel around the country visiting our supporters and churches. We are very excited to come and see you! We are even more excited that we will get to introduce you to our new addition so soon after birth. Right now our plan is to come back to the States sometime in June and to stay through September (finishing off our trip with New Wineskins 2019 in North Carolina). While June is far away, a trip of this size, with a new baby, is going to take lots of planning. Especially since adding an addition to our family means an increase in our budget. Please pray for us as we already begin planning/organizing for next year. We want to see as many of you as possible, which takes a lot of organizing. Please also pray for us as we will need to raise more financial support for the Little Bean. And finally, please pray that we will be able to fit everything into those four months next year. We are trying to miss as little of Fall 2019 here in Belize as possible. While we are super excited to come back to see you, we also love our ministry here (and the busiest/best time is the Fall). Lots going on, lots to plan. Thankfully God is always in control. And with all the planning we may try to do, His plans are always better! We will continue to update you on all things Belize as well as our plans for next year as they become more solid. We may even be contacting some of you directly as we work out schedules to visit next summer. Please continue to keep us in your prayers. And as always, if you would like to join our team (both in prayer and/or financially) please click on our support link. We know we are only able to stay here and serve because God has given us partners like you. Thank you! It’s been a few months since our last update, but I think this one will make it worth the wait. It has been some months since we have posted anything on our Prayer blog, and over a year since I (David) wrote an update myself. The fact is that Mary Beth has been giving such an powerful account and summary of our life and ministry here, and so many of you have told us you are enjoying her take on things. Honestly, in the end, I haven’t wanted to get in the way! The title of this post is A Trying Time, and I mean that in two senses: we are trying a lot of new things in ministry, and life and ministry feels a little trying at this moment. So, though things are super busy right now (as you can imagine) I’m going to try and find a way to break them down and give you a picture of what’s been happening with us, our churches and our schools! Mary Beth and I have had a good year so far, by the grace of God, but it’s been far from easy. If you’re looking for ways to pray for us, let me share some of what has been going on. Between the two of us, I have been the one with the majority of health issues popping up. Apart from my ordinary struggles with gluten, I began seeing the doctor for an injury that I had sustained in January 2017 when I slipped and fell hard on my right elbow. Even after a year, the pain had not gone away … to the point that I was unable to use long-sleeved shirts or jackets! In February, after another fall, I ended up consulting with a great orthopedic surgeon, it became clear that I had damaged my bursa and the tendons connected to my tricep. In addition to oral and topical treatments using steroids and NSAIDs, the surgeon gave me three cortisone injections in my elbow over the course of a couple of months. I am happy to report that the vast majority of the pain in my elbow is gone, and I believe that my elbow is on the road to recovery! Praise the Lord! Nevertheless, other health problems have emerged along the way. Not only did these medications provoke a hard response from my body in general, but over the last few months I’ve begun to experience other frustrating symptoms that last week drove me to consult a specialist in internal medicine. We may not have figured out what has been the cause of all my symptoms, but when they took my blood pressure it was sky-high: the first time in my life I have had problems with hypertension. I am currently under observation, taking my blood pressure twice a day over the course of two weeks, with the hope that my average blood pressure will stay down and I won’t have to go on medication. However, the long-term solution (according to the doctor) is that I need to lose 20–30 lbs. Fair enough. So, Mary Beth and I have been getting up early to walk hard and fast in the morning, and I hope by the end of the year to have gotten my weight down to the point that my blood pressure won’t be in jeopardy. I also have to work on how I am handling the stresses of ministry, especially when they are compounded with happenstances of life and living. For example, earlier this year the hard drive of my computer crashed, around the same time that the screen of Mary Beth’s computer went caput. So I was able to cobble together the two computers and make one functioning computer. I ended up losing a lot of personal data from the 10 months prior (previous files had all been backed up), including some fundraising and supporter information (so, if I come calling asking for info that I should already have, that’s why!). But fortunately, our churches’ information had been backed up on the “cloud” and the local impacts of the hard drive crash were minimal. But I guess why I am sharing this is that things like this, and many others related to life and ministry begin to add up for me, and according to the doctors I’ve been consulting they can take their toll. I am trying to learn better how to give these things over to God in prayer, and trust him to handle them … and not pretend to take over God’s job by worrying about them. On the other hand, Mary Beth is adapting incredibly well to life in Belize. Her piano studio is full (with around ten students), and they’ll be enjoying their end-of-semester recital next weekend. She has also been making friends, and even adapting to the heat (trust me, she is as surprised by that as you are!). Belize for her is starting to feel normal, feel like home, and this is a real gift from the Lord. Granted, she still doesn’t like bugs (stay tuned for another scary bug story!) but I can tell you I’ve never seen anyone that has a knack for killing mosquitoes like she does right now! And her Spanish is getting quite good these days too: she has even been reading the Bible publicly in Spanish when we have visited some of the Hispanic missions we work with, and folks are quite impressed! And we have both been encouraged by you, by your prayers and your emails and your gifts … and in some cases, by your visits! When we hear from you, God himself is encouraging us through you, and it makes a tremendous difference. So thank you, and please (please!) continue to keep us in your prayers … even when it takes a few months for us to write an update. Things are going very well for our churches right now, and it’s a pleasure to be able to share with a bit about it with you. I love it! And people do seem to be finding that connection, about which we are pretty excited. Our church attendance at St. Andrew’s has grown significantly over the past two years (overall 14% last year, 12% so far this year), and most of this growth has been new families attending or even joining the church. We have to acknowledge that much of this growth has come about because of the support that we enjoy from our three schools: without the good relationship between them and our churches, we would not be enjoying this kind of increase in attendance whatsoever. In fact, this growth is rapidly forcing us to confront an emerging (good) problem: space and seating at St. Andrew’s. As we quickly approach an uncomfortable number of people on a regular basis, often bumping up against the capacity of the sanctuary (especially during the Fall Semester), we have to consider ways of expanding. One way that seems like a possibility (and, please, pray about this!) is for us to add a youth-oriented, youth-run evening service on Sundays. We have some structural hurdles to overcome with regard to neighbors and noise, but we believe that this will be a better option at this moment than a church-planting effort: we tried to get an evening-service church-plant going for over a year, and the door seems closed at this time. So please, pray that a way is opened for us to hold Sunday evening services at St. Andrew’s and, if it pans out, that they bring glory to the Lord and bring more people to know his saving love and power! St. Hilda’s is also growing in some pretty cool ways too. Last year the mission’s attendance grew by almost 50%, a massive increase after a few years of stagnation. Although our attendance has stabilized and not quite enjoyed the growth spurt of the previous year, what we are seeing at St. Hilda’s is an emerging leadership team that has the capacity of carrying the church forward. For the first time in years, St. Hilda’s has a Church Committee, a visible outreach, and the prospect of new ministries for the coming year. I’m enjoying seeing how God is bringing new life after a season of dryness, and I cannot wait to see what he will be doing in the months to come! There are of course frustrations along the way. Two of our lay ministers at St. Andrew’s (a husband and wife) have resigned over the past year, and some of our new possible lay ministers at St. Hilda’s have not gone through with training. I am also even more aware of the necessity of a church having a dedicated treasurer, and we’ve had a turnover in that department at St. Andrew’s over the last month. Still, we see God doing incredible things, and we cannot wait to see what will happen by this time next year. And of the many things that we do, our youth work has been one of our greatest joys. The St. Andrew’s youth group had its Spring Term outing back in April as a dozen kids joined up with youth groups from around Belize to paint the building of one of our Hispanic missions. Afterwards, Mary Beth and most of the kids went cave tubing (I stayed behind with the rest because of my elbow), which was an incredible experience! Mary Beth’s Bible study with the girls has also continued strong, and her connection with these young women is strong and bearing fruit for the Lord. It’s really wonderful to see. The children’s choir has had a rough Spring, with kids’ changing behaviors and attitudes, and there will be some changes in the Fall when it starts up again. And yet, it was still an overwhelmingly positive experience for the children and Mary Beth is looking forward to what this next school year will bring! And of course, graduation season is upon us, and with it commencement exercises and a wistful look at what has come. It’s also at this time that St. Andrew’s chooses scholarship recipients, and in addition to the High Scholarship Scholarship Recipient that was chosen last year, the Committee chose one of the students from St. Barnabas’ to receive this same financial aid for the next four years. (N.B. High School tuition is not completely subsidized by the government … it can still cost USD $500 to send a young person to high school.) Our experience over the past year has demonstrated that such scholarship are not simply about money and tuition, but about supporting these teenagers in every aspect of life. And it may sound like a cliché, but it’s true: God has blessed us as a church by being involved in their lives just as much as we have been able to be a blessing to them. We are so excited to be able to dive into this next school year, ministering to and alongside of them! There’s much more that we can say or share about all these things (and it may take one of Mary Beth’s updates to do them justice), but I want to move on to what is coming up over the next few months, and how you can be praying for much of it. There are a lot of things on the horizon that we would like to share with you. We can begin with this weekend! Our predecessors, Fr. Juan and María are here in Belize with us right now, and it’s amazing. They have come to celebrate the Quince Años (turning-15-years-old birthday) of one of our parishioners, and we are overjoyed to host them. The Quince Años falls on Saturday, and the next day Fr. Juan will be the guest preacher at our Baccalaureate service for the graduating classes of our three schools. In July we are looking forward to our “Family Fun Day” in the park, as we hold services in public and then spend the rest of the day playing games and sharing in potluck food. It’s going to be quite the day! The following week, St. Peter’s (Tallahassee) will be sending a team to help us hold our Vacation Bible School for the kids that week, and it’s going to kick off an active but promising summer. Mary Beth and I are planning on going on vacation in August, and we’ll be back to kick off the new school year by September … hopefully inaugurating the new evening service at St. Andrew’s that I mentioned above. And then our year begins all over again! Let me add a couple of other things. 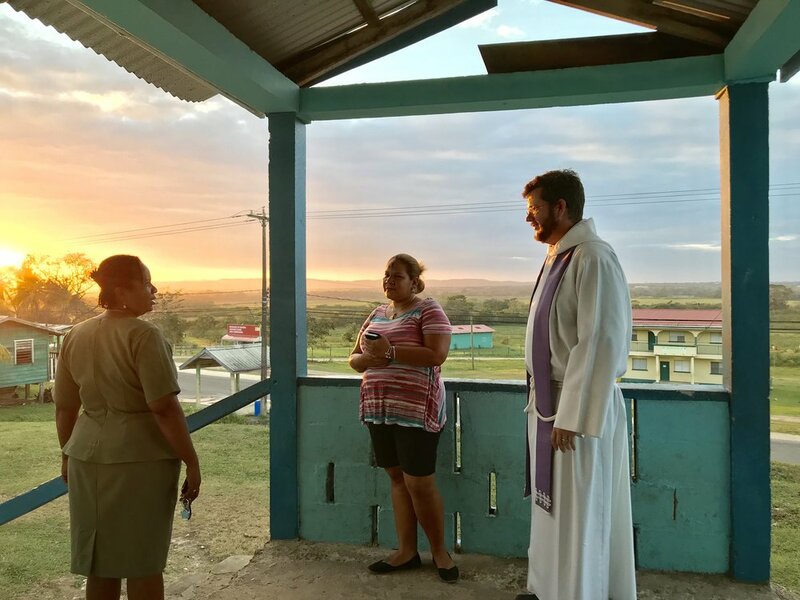 Last month the Anglican Diocese of Belize held its 50th Diocesan Synod, with a focus on intentional discipleship and greater accountability for the leaders, churches, and other structures within our Diocese. It was a surprising weekend, from Mary Beth playing the organ at the Cathedral to what Bishop Wright shared at the concluding Solemn Eucharist. It appears that in the interests of structuring our Diocese a little better, the Bishop will soon be appointing a team of people with certain diocesan responsibilities and roles, with the goal of making things here run smoother and better, as well as passing on the torch of leadership (as it were) to some of the younger clergy. My name was among those mentioned, although without yet any definitive description of what will be entailed. I do think this is a very positive development for our Diocese, and probably for me as well, but I would ask that you pray for me and Mary Beth as we try to serve the Lord here in whatever way he calls us. And as we approach to the second anniversary of our return to Belize (we came back in August 2016), we are also trying to figure out how and when we will be returning in mid-2019 to visit with our churches and supporters and raise the funds necessary to come back. Please pray that God will show us how best to do this within as reasonable an amount of time as possible, and please also pray that the Lord will fully bring us up-to-budget before then. We are so grateful that new individuals and churches have stepped forward to pledge their support, and we it’s true that we’re not in the red as we were last fall. But we are still looking for people to step forward and give to this ministry. Would you consider becoming one of them? Again, thank you all so much for your prayers, for your gifts, and for your support. We are deeply grateful, even if it sometimes takes us a while for us to get out an update and express it! 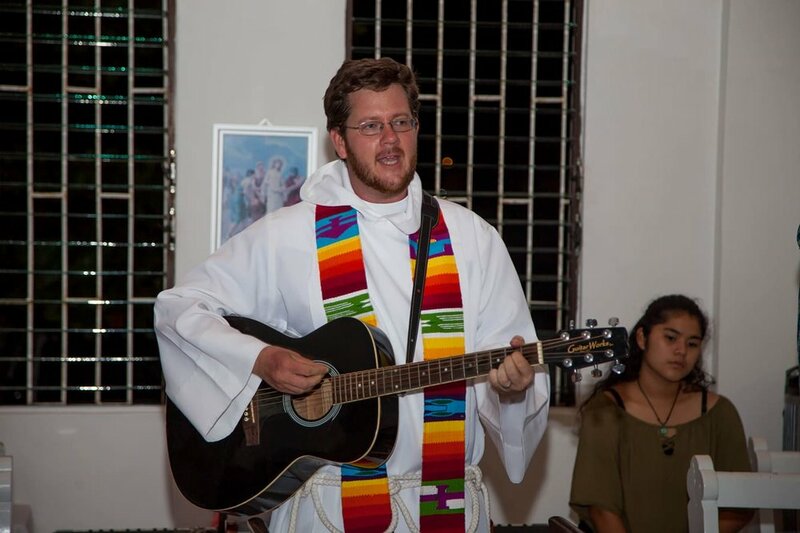 May the Lord richly bless you for all that you do for us and for the spread of his Kingdom in Belize! You might be saying, “Why is she still saying Merry Christmas in January?”, but today is the 12th Day of Christmas (12 Drummers Drumming! ), so I've got this one more day left to wish you the merriest of Christmases! It’s 2018! It sort of feels like we sprinted into the New Year, but that just means I have lots to update you on! Our busiest time of year is always the Fall Semester, but Advent (plus Christmas) is the busiest of the busiest (in the best way!). Before I get into the many different ministry things that have happened, let me tell you a couple of the personal highlights from the past month. One of the biggest highlights for me was having my parents visit at the end of November. This was the first time my parents came to Belize, and it was a wonderful trip! Not only could we show them some of our favorite places, but we were also able to show them a little bit of what we do here in Belize. We always love when people come visit us, and it was extra special to get to host my parents for the first time. Come back soon! Then the week before Christmas we had another visitor! One of my long time best friends came down from California to spend a week with David and me. We were able to take some of the days to show her this beautiful country, and then we packed the evenings and nights with lots of Christmas ministry activities! We had so much fun (and loved the extra help!). Overall, the addition of family and friends to the holiday season was such a treat, and one we will always welcome back. Now to move on to the many different ministry things that happened. I’ll try to cover most of the highlights without making this a super long update! Every year the first Sunday of Advent also falls on St. Andrew’s Day, which means Confirmations, the Bishop visits, lots of good food, and extra presentations. 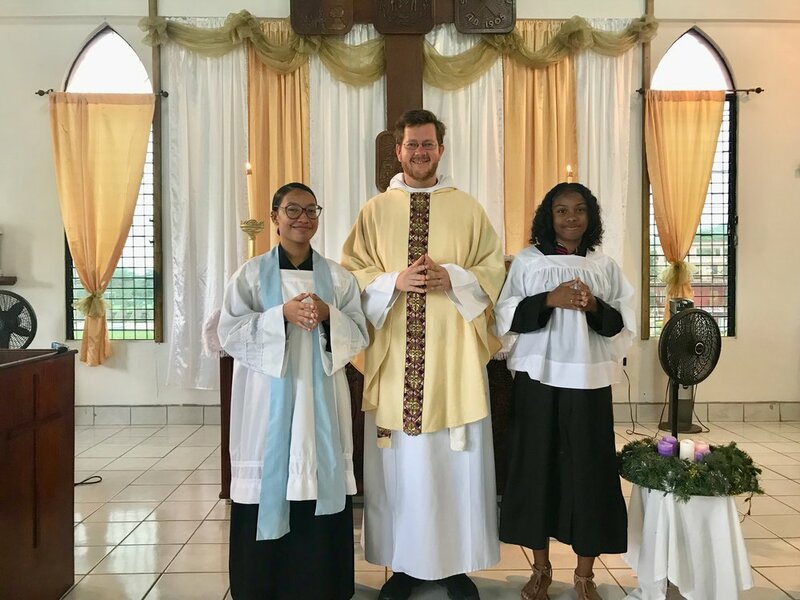 David and one of the main Catechists spent weeks teaching Confirmation classes to kids and adults alike at both St. Andrew’s Church and St. Hilda’s Church. After studying and examinations, each of the confirmands passed and were presented to the Bishop for Confirmation. It was quite a celebration! To add to the celebration of the day, the youth choir that I’ve been working with was asked to sing one of the songs they had been preparing for their upcoming Christmas concert. That was the first time my choir sang during the principal service at St. Andrew’s, and it is definitely something we will do again. The majority of the kids in choir either don’t attend our church, or don’t attend church at all, so it was wonderful to have them participate in such an important service. Then, what’s a celebration without food? So to top off everything the service was followed by pibil tacos. Pibil is pig that has been cooked underground all day and then shredded for the tacos. If you have never had it, make it: find someone who makes it, do whatever you can to eat it. Seriously, eat it. So good! After the St. Andrew’s Day celebrations we jumped in the truck and dashed over to St. Hilda’s Church for their confirmation service. Six girls, all dressed in beautiful white gowns, very excitedly Confirmed. I think the cutest thing at their Confirmation was when it was time for the girls to take their first Communion. Now normally at St. Hilda’s everyone who is taking Communion goes up first, and then all the kids that are just getting a blessing go up after. Well these girls were so used to only getting a blessing that after they took Communion for the first time they jumped back to the front of the line for the children’s blessing with the rest of the kids. It was adorable. School was still in session, so we had our usual week’s work, but the highlights for me had to do with the choir. Every year St. Andrew’s School finishes off the semester with a Christmas variety show where each class gives some kind of presentation (a song, poem, skit, etc.). Since all of the kids from the choir attend the school they were asked to sing one of their pieces as part of the show. I was so excited for this opportunity for the kids! They had been working so hard for weeks to prepare their music, and I loved that they were getting multiple opportunities to not only show their hard work, but to sing all these songs about Jesus’ coming. They did really well! Then the following day they were able to sing even more of their songs in the middle of town for the San Ignacio annual tree lighting ceremony! The kids were cute and did such a good job. These outreach opportunities were the biggest additions to the choir this year, and the kids had a lot of fun getting to sing for so many different events. This week was the absolute busiest! Since school had officially let out for Christmas break, we filled almost every night with some kind of activity or outreach project for the kids. Monday night was the first ever piano recital for the kids in my studio. They were so nervous, but they did a FANTASTIC job! Pretty much all of my students started taking lessons at the same time, so it was a fun challenge to find music they would each like, that would also be different from each other. They each approach playing the piano differently and there different styles came through when they performed. I was so proud of their hard work! And what would a recital be without dessert? So after all of their hard work we finished off the evening with Christmas cookies and fudge. Yum! I’m going to skip Tuesday just for a second and come back to it with Thursday (two very good days!). After weeks of practice and multiple mini performances throughout the month, the youth choir gave their end of the year final concert at St. Andrew’s Church. The kids performed a program called “Light of the World” by Mark Patterson, which tells the story of Jesus being the Light of the world through songs and short scriptural readings of the nativity. This was such a fun program! It had traditional carols from different countries (like France and Puerto Rico) that kept the kids having fun in every song. We were missing quite a few kids, but they did a great job telling the story of Christ through song, for friends, family, and fellow church members! And again, what is a good performance without food? So we finished the evening with a dessert reception to wrap up the year with a time of fellowship … and sugar. Alright, these were probably our best two night that week (and that is counting some already pretty great days!). For the past three years St. Andrew’s Church has gone caroling around the community and while brining baskets of food to people in need. This year the plan was to invite the youth choir to join the youth group, and any other members of the church that would like to come. Well Chaa Creek Lodge and Resort found out about our plans to carol and wanted to help in anyway they could. They love getting involved in community outreach and were excited to join alongside us for these two nights. What we weren’t expecting was how generous they would be in their help! We had a meeting to discuss logistics and they offered to not only treat the kids to dinner at their nice restaurant in town, but to provide resort vans (and drivers!) to drive us all around town to carol! For both nights! So on Tuesday and Thursday we had about 25 kids overrun their restaurant to eat before being carted around to carol. The kids had such a wonderful time! But I don’t think the kids joy even came close to that of the people for whom we caroled. The first night we caroled for people in our community who were in need, but the second night we primarily caroled in the community of the people who were affected by the explosion earlier in December. For those of you who did not hear about that incident, a rock quarry illegally setoff dynamite in a residential area, killing one man, and destroying many, many homes. It was truly a tragic event for so many families. These families had been through so much and we loved brining them a little hope and joy! Overall, it was a really good two nights of caroling, both for those who we could carol for, and also for the kids that got to participate in community outreach. Pretty short since it was only really Sunday morning … =] The fourth Sunday of Advent falling on Christmas Eve definitely made for a short fourth week! These four days were ones of pure celebration! The “Eve” services were celebrated at St. Andrew’s Church and the “Day” services were celebrated at St. Hilda’s Church. Each service is special in its own way as the churches fill with people coming to celebrate the birth of Christ. While we have a Christmas Eve service and a New Year’s Eve service that we call Watchnight Mass, it is actually finished no later than 11:30, any later and we wouldn’t be able to hear each other. Now when I say people do fireworks here I mean, people REALLY do fireworks here. When the clock strikes 12 it sounds like a war zone, complete with so much smoke you can’t see across the street, and sirens going off all over town. It doesn’t matter if it’s from the backyard or the middle of the street, fireworks are setoff by almost everyone. It is quite the way to welcome in the birth of Christ and then the New Year! It’s hard to believe that so much happened in just a month (and so many other things that won’t fit in this update)! God is doing so many amazing things here in Belize and we are really excited to see what He has planned for the New Year. School starts up again next week, so we are busy getting ready for the new semester and the restarting of all the things that were on break during the holidays (chapel services, choir, piano lessons, Bible study, youth group, etc.). So I’d ask your prayers for us as we start this new year; for the old things starting up again, and the new areas of ministry God is calling us to this year. Thank you again for all of your continued prayers and financial support. We are truly grateful for all of our partners in ministry! First a quick look at the youth choir. Now that we’ve had a few rehearsals, I can pretty much tell who my regulars are for this year, and while they are incredibly “energetic,” this group of kids is a lot of fun. It is truly a learning experience for me as I’m figuring out how to work with a mix of boys and girls. In the past semesters I’ve primarily had a girl choir, and it turns out girls and boys are very different! Who knew?! I would also add that God is teaching me patience =] These kids are working very hard to prepare for the different performance opportunities coming up next month and I think they're going to do a great job. Besides their Christmas concert, they are getting excited to sing on December 3rd when the Bishop comes for St. Andrew’s Day for the Confirmation service! This will be the first time this group sings for people and they were very excited to have been asked to give a special presentation. Speaking of confirmations, we have kids both at St. Andrew’s Church and St. Hilda’s Church preparing to take their confirmation exams. For the past month and a half kids at both churches have been attending classes that teach them about Confirmation, The Lord’s Prayer, The Apostles' Creed, The Ten Commandments, The Beatitudes, and the different kinds of Sacraments. While the kids have to be able to recite these different things in the exams, the most important part that they learn is what each piece means. David himself is catechizing at St. Hilda’s Church and even though it’s important that the kids practice The Ten Commandments, for example, in order to recite them (we even bribe them with brand-name, full-size candy if they can recite them correctly! ), the actual class is focused on explaining what they mean and why they are important. So in the exam David will ask the kids to recite The Lord’s Prayer and then he will ask them what it means when we say, for instance, “give us this day our daily bread.” When I was younger I remember saying The Lord’s Prayer so many times, but not really understanding what I was saying. I would have loved a class like this! David is really great at breaking down these different aspects of our faith so the kids can really understand why they are important. We are really excited to see each kid confirm and renew their baptismal vows! There really are so many different things happening right now, it’s hard to pick things apart to tell all of you. Let's see. Youth group, chapel services, piano lessons, and the girls Bible study are continuing to go really well, with the kids participating more and more with each event. We are excited to see what God has in store for all of these kids! While we work with many different people here in Belize, the majority of what God has us doing is directly ministering to and discipling kids. We are really loving watching these kids grow and seeing God’s hand in their lives. Can you believe it’s already almost the middle of October? For some of you that might mean that the nice cool fall weather is starting with crisp mornings, or maybe some changing leaves, but here in Belize fall means (admittedly pretty hot yet) beautiful days, new flowers, and even some crazy awesome afternoon thunderstorms storms. It’s interesting looking back at the past 14 or so months that we’ve been here and realizing that not only am I so used to the weather here that it really is starting to feel like Fall (two to three showers a day and all! ), but I’m also already looking forward to the holiday season and the new traditions we have here in Belize. For those of you who don’t know, David and I were blessed to be able to spend our first vacation together since we got married in Peru last month. We had an absolutely amazing time exploring the Andes and just spending time together! We came away with lots of stories and fun memories. But while we loved every part of our vacation, we were very happy to return home to Belize two weeks ago and get back into ministry. Basically, coming back at the end of September meant we hit the ground running! The first thing we had to get done was immigration stuff for me. Before we left for our vacation I was able to apply for my permanent residency here in Belize (it was fantastic that we made the application before we left! ), but since it is a processes that takes years to complete I still apply for a temporary work permit every year to keep me in the country legally. We got back home just before my work permit expired and are now in the process of obtaining the new visa. Praise be to God it’s approved and all we have to do is go to immigration to get the new stamp! For everyone who has been praying for my immigration process, thank you! Now that we’re back home we’ve gotten to restart the different ministries that had sort of been on break for a few months, whether due to Summer break or our vacation. Our first week here had us right back at the schools restarting chapel services. I hadn’t realized how much I missed all these kids until we were back teaching them again! The newest thing that we started this semester with the children’s chapel is that we’re separating the ages more at our rural schools, St. Barnabas’ and St. Hilda’s. That means David is able to take the older kids and have a more focused service for them, while I now teach the younger ages. Now, this is not something I thought I would ever be interested in, but I love it! Basically I get the kids from about kindergarten to second grade. I’m taking the them through Bible stories from the Jesus Storybook Bible, as well as praying together, and singing lots of songs! We’ve only had one service so far, but I think I’m going to like teaching these kids! The next thing that is starting up again is youth choir! This is my third semester leading this choir and every time I start it up it seems to go a little bit better. Since we launched youth choir at the beginning of October (which is later than normal) I felt it was perfectly acceptable to start working on our Christmas program. Besides the fact that I love Christmas music, the kids are super excited to get to sing Christmas music this early! One of the great opportunities with a children’s choir (particularly as we get ready for Christmas) is that I’m able to teach them songs about Jesus and the true meaning of Christmas. All of us like “Jingle Bells”, but now I get to teach the kids songs that are just as much fun with maracas, drums, and tambourines, that focus entirely on our Lord and Savior. Last year I had the kids participate in a traditional Lessons and Carols service with them singing a few traditional carols, but this year I decided to use a Christmas program that I was in years ago when I was in a youth choir (shout out to Robin Segarra). I’m really excited to teach them this program because I can involve lots of kids in all these songs that tell the story of Jesus as the Light of the World through the story of the Nativity. The kids are super excited to be singing this music and even getting to sing in French, German, and Spanish! At our first rehearsal seventeen kids showed up to try it out and see what they thought about choir. It was so much fun! And this week we had two more kids show up! We'll see how many kids come next week, but I think they’re going to do really well with this program (and have lots of fun singing!). They’re already excited to get to sing for their parents in December! Piano lessons are also off to a good start as the kids are getting back into practicing and we are starting to talk about the Christmas recital. I haven’t held a recital yet with the kids here, but I think Christmas music will be a good place to start, and I have yet to have one of these kids tell me they don’t like Christmas music! Speaking of things starting up again, this past Saturday was the start of the High School girls' Bible study. Over the summer I had started the Bible study as a sort of “test run” to see if the girls would be interested, and to see if it was something I could actually teach. We went through the book of James and it went so well that we’re going again, but this time through the book of Romans. I love getting to spend time studying God’s Word with these girls! It’s amazing both to get to talk through different questions they might have about the Bible and then to spend time just getting to know them better while we eat desserts (food is always a necessity!). As a whole I think the Bible study is going really well and I’m excited to see what God has in store for us to learn. Let’s see … as far as big events happening in the church, it is officially time for Harvest! The next two weeks consist of lots of Harvest Festivals happening between the three schools where we serve. At St. Andrew’s, this service is easily our largest attendance for the whole year. I always thought it would be Christmas or Holy Week and Easter, but Harvest definitely tops all of those combined! Last year St. Andrew’s had over 700 people attend the church for these special services. For those of you who don’t know what this kind of service is, think of it like a GIANT Thanksgiving for the gifts God has given us. Each class processes up the aisle with decorated baskets of fruits, vegetables, pastries, etc. and then presents them to be blessed at the altar. Afterwards they give a group presentation expressing thanks, and then the next class will come up with their gifts and do the same thing. Church always packs out, with people standing in the back, crowding up at the front, and even standing outside the church because it’s not physically possible to get anyone else inside! Once the service is finished the items are then sold as a type of fundraiser for the school and church. At our rural schools, St. Barnabas’ and St. Hilda’s the church (or school) is packed and many of the gifts are collected and given to families in need. Yesterday was actually our first Harvest Festival service at St. Hilda's. All the kids did so well with their presentations and their baskets were beautiful! As a whole, these services are incredibly important and widely attended by all the families of the school kids. Please be praying for David and all those serving! It’s going to get pretty busy! While there aren’t really a bunch of new activities going on right now (except for boring-sounding administrative stuff, like how David’s on the Diocesan Education Board now), there are lots of good things starting up again! And since it’s been awhile since I’ve written an update I thought it would be a good idea to let you know what’s going on down here in Belize! As the holiday season starts it also becomes pretty clear that it can be one of the busiest times in the church year, but it is also my absolute favorite time to be in church! There is always so much going on, and so many extra things that come up. This is the beginning of a great season for ministry! As I’m coming here to the end of this update, looking back over all these different ministries going on with us here in Belize, I get so excited! I’m so excited for the things that David and I are already working on, and the things that God has planned for us here that we don’t even know about yet! But while on one hand I want to just tell you all the good things that happen here, I also have to talk about the slightly uncomfortable stuff. Mainly, I have to talk about money stuff. It almost seems like taboo to bring it up, but a big part of our work as missionaries is just raising the support to keep us here on the mission field. When we came back to Belize fourteen months ago (I still can’t believe it’s already been that long!!) we had NOT actually made it to our full monthly support. We were getting close, but after talking to our missionary society we all decided it would be better for us to get back to Belize to start our ministry here (and see what my ministry would be! ), while working on raising the rest of the support. Before I go any further though I have to thank all those who have both been supporting us from the beginning, and those who have joined our ministry team since we’ve been back in Belize. We are incredibly grateful for all of your prayer and financial support! But as we’ve passed the year mark here in our ministry in Belize we have had to assess our current level of financial support for the next year here on the mission field, and the following years that God calls us here to serve. While we have been living here for over a year, we have been, and very much still are living in a growing deficit between gifts to our ministry and the minimum budget needed to keep us on the field. By the grace of God we have had generous donors support us both monthly and in one time gifts (thanks be to God! ), but if our current deficit in giving continues, we will have to return from the mission field much sooner than planned to re-raise support again in the United States. So here’s what David and I are asking. If you believe in the ministry that God has called us to here in Belize, we would like you to prayerfully consider joining our team as financial partners. God calls each one of us to be a part of His Great Commission; if not to go personally, than to send others. We cannot serve with the people of Belize without people like you partnering in our ministry by sending us. Every person or family that supports us financially and through prayer is completely a part of our ministry here in Belize. So please consider supporting the work we’re doing here by linking up with us financially whether through monthly giving or one time gifts. Everything helps! I’m attaching the link at the bottom here that will take you straight to the page where you can make an ongoing monthly pledge or a one-time gift. And if you ever want to find out more about our ministry here, how you can be even more involved, or even come and visit us, please email or call us! We would love to talk to you! And as always, please continue to keep us in your prayers. There is always a lot going on here and we know that without God we could do nothing. Thank you!